In this file photo taken Tuesday, Nov. 6, 2018, a model of Chinese BeiDou navigation satellite system is displayed during the 12th China International Aviation and Aerospace Exhibition, also known as Airshow China 2018, in Zhuhai city, south China's Guangdong province. Those that desire a peaceful future in space should keep an eye on developments in the Antarctic. In separate but interconnected mission goals, published by the state funded China National Space Administration (CNSA), tasked with setting policy for space, China aims to launch its first Mars probe by 2020, probe asteroids by 2022, and launch an exploration mission to Jupiter by 2029. Plans to establish a lunar research base are afoot, led by the Chang’e 4 lunar landing on the far side of the moon, a Yuegong-1 (Lunar Palace 1) 365 days simulated experiment at Beihang University, Beijing, where eight students lived in conditions similar to the lunar surface. Inside the lunar module, the students conducted bioregenerative life support system experiments, growing food like wheat and potato from their own waste. The aim, according to Liu Hong, chief designer and chief scientist of Lunar Palace 1 was to further seek a ride on China’s lunar and Mars probes to study the sustainability of human colonization and long term settlement within a bioregenrative life support system on the moon or Mars. Experiments to sustain human reproduction were conducted by China in April 2016 when the SJ-10 recoverable satellite took about 6000 mouse embryos to space, which demonstrated that some of the embryos developed in space. For China, investing in the incremental development of its space program is connected to its long term ambitions to utilize space for its vast resource potential. This is consistent with its objectives to develop China into a country that benefits from the most advanced indigenously built space technology, especially tied to its national development goal of overall rejuvenation. The advantage China has over countries like the United States, India, Australia, or New Zealand (NZ) is that the CPC does not submit itself to democratic elections every four or five years. This aspect augments the Chinese regime’s capacity for long term planning and resource commitments. After President Xi Jinping came to power in 2013, China has engaged in visible demonstrations of its power by asserting its stake on disputed territory to include the South China Sea (SCS) islands, disputed territories with India and Bhutan as well as the East China Seas (ECS). Significantly, while China asserts that it will share its space technology with other countries, framing outer space as a “global common,” and abide by international and bilateral agreements, China’s past behavior of staking claims to territory based on “first presence” and historical revisions, to include the SCS islands, Tibet, and Taiwan, offers us little assurance that it will follow through on its commitments to recognize other stakes on shared territory in outer space, to include the moon, especially if those areas are rich with resources. Tibet (an area rich in water and mineral resources) and the South China Sea offer evidence of China committing to non-escalation of conflict on paper with countries like India (with regard to Tibet) and fellow signatory countries of the Declaration on the Conduct of Parties in the South China Sea, while engaging in escalatory behavior of taking over territory by force. This aspect was most evident when Xi assured former U.S. President Barack Obama in the White House in September 2015 that there were zero plans to build a military base on artificial islands in the SCS. Yet we know from subsequent evidence that China had plans to do the exact opposite and went ahead and built military facilities on disputed islands. China’s militarization of the SCS has been a gradual process, where alternative actions by the United States, as well as other countries, could have changed the course of history. China’s behavior in Antarctica could offer valuable insights on how it might behave in outer space once it establishes a presence, for instance, on the lunar surface. Antarctica is the coldest, driest, and windiest continent on the planet with access over the last 100 years being in support of science and exploration exclusively; however, more recently Antarctica has come under increased attention as nations seek solutions to the challenges of resource scarcity, climate change, and food security. What do these three areas have in common? Strategic territory, an ability to solve resource scarcity issues, energy, and the ability to leverage a world where actions fail to prevent Chinese aggression. The West needs to understand this threat, the impact now and in the future, and strategize to combat it. The Antarctic Treaty System (ATS) was established in 1961 by the territorial claimant states; Argentina, Australia, Chile, France, NZ, Norway, and the U.K. along with several non-claimant countries including the U.S.S.R and United States. The Antarctic treaty defines the Antarctic continent as the land and ice shelves below 60 degrees south. The treaty stipulates that all territorial claims be suspended, the region to remain demilitarized and nuclear-free, and the primary goal is for cooperative scientific exploration. Additional agreements over the continent include the Convention for the Conservation of Antarctic Marine Living Resources (CCAMLR, 1982) to protect marine resources, and the Protocol on Environment Protection of the Antarctic Treaty (1991), known as the “Madrid Protocol,” which forbids the exploitation of mineral resources. Any alterations to the ATS cannot take effect until 2048 without unanimous approval. Economically, interests include tourism, fishing, logistics for expeditions, the involvement of businesses in Antarctica, and the potential exploitation of scientific research from the continent. For example, fishing by NZ-based fishing companies in the Ross Sea and Southern Ocean bring in approximately NZ$20 million (US$13.6 million) per annum. However, CCAMLR tightly prohibits overfishing which can, as a direct flow-on effect, affect the availability of fish in other EEZs. Tourism includes country based activities including international Antarctic attractions in several major cities as well as sea tours of the region. Nations are keen to further exploit the potential economic upsides but remain wary of utilizing large-scale commercial operators due to the strategic importance of the region and the desire to retain political control. Politically, interest for claimant states is based fundamentally around the maintenance of their sovereign claim to the continent and a strong desire for involvement in international Antarctic governance. In NZ’s case, its geographic location and reliance on other states for maintaining security and access to markets drives the dependence on multinational relationships and alliances to pursue its foreign policy. However, Illegal, Unreported and Unregulated (IUU) fishing in the Ross Sea is raising significant concern, particularly the fact that some of the infringing fishers are from ATS signatory states. A Stockholm report from January 2015 tallied 147 cases of suspected IUU activities in Antarctic waters using 72 vessels between 1995 and 2009. These vessels frequently change their names and flag states to conceal the true beneficiaries of their fishing. Although CCAMLR protects the legal catch, it will take a significant investment in surveillance and security systems to avert IUU fishing. NZ’s recent acquisition of the P-8 Poseidon from the U.S. Navy will assist in the Intelligence, Surveillance and Reconnaissance (ISR) of the “deep south” and the ability to kinetically target the IUU fishers may provide a deterrence effect. Furthermore, it is envisioned that the acquisition of space-based sensor assets will have a marked impact on the surveillance of the Southern Ocean. In recent times, vessels have been caught illegally fishing in Antarctic waters for toothfish. Although detained and prosecuted, given the various flags these vessels posses and the multiple nationalities of the crew, it makes it difficult to pinpoint the beneficiaries. With the growth of the world population, plentiful Antarctic waters, shortage of food resources, and the lack of prosecution through hard power; illegal fishing is likely to rise, particularly if ATS states are shielding the vessels. Anne-Marie Brady suggests that China is flouting the rules of the ATS. In 2014, the Chinese krill catch was 55,000 tons, worth approximately$10 million, however, in 2015 China announced plans to increase their intake to between one to two million tons. CCAMLR restricts annual krill catch to 680,000 tons. As such, Chinese plans were to definitively and pugnaciously exceed the limits. Moreover, China’s record of IUU fishing is poor. China refused fisheries permission to board and inspect four Chinese flagged vessels caught illegally fishing in the Southern Ocean in 2007, and in 2016 the Argentinean Coast Guard sank a Chinese flagged vessel illegally fishing in a protected area. China’s antagonistic disregard of the ATS is not the only example where China flouts the CCAMLR rules. Although China joined CCAMLR in 2007, it explicitly did not necessitate Hong Kong (HK) to seek membership, in fact, Bliss argues this is “diplomatic deception” as HK is the base of the multinational fishing company Pacific Andes which, through its activities and that of its offshoots, is heavily implicated in the illegal fishing of Patagonian toothfish. IUU fishing is not only a security risk to the Antarctic region, it flouts the laws of the global commons and displays ill strategic intent. With global food security issues, it is likely to increase given the difficulty in prosecuting and deterring offenders. If signatory countries of the ATS do not have the political will or desire to take kinetic action against these offenders it must aim to use diplomatic power and political means to discourage the offenders, particularly China. If such behavior is not exposed, and the world continues to stand by and silently observe this exploitation by China, it will likely continue and expand into other resources, to include space based resources. With climate change, global demand due to a rising population, the world’s energy crisis, and advances in technology/extraction methods, Antarctica’s minerals are ripe for the picking. Research to date suggests Antarctica has bountiful stocks; it is home to four of the 10 minerals with less than 25 years of global reserves, and a further five of 14 with less than 50 years reserves. Given global population growth, it is likely that by 2050 demand will increase by an additional 25 percent. Although extraction methods are not financially viable at present and the “Madrid Protocol” prohibits extraction of such minerals (until 2048), as necessity is the mother of invention, innovative methods are likely to arise. Furthermore, under the guise of “scientific research” any exploration is deemed accidental, which creates the situation where many real exploratory events are masked under the name of science. This exploration and potential mining are of concern as any conflict arising over minerals would likely involve multiple sovereign claimant states. NZ’s sovereign claim area alone is believed to hold more than 200 billion barrels of oil plus numerous minerals such as calcium, copper, iron, magnesium, and phosphorus, as well as an abundance of Krill stocks. Any conflict arising would adversely impact sovereign claims and likely influence multiple nations security. Scholars suggest that China is the foremost player in the mineral exploitation game, as their four (soon to be five) bases are all in areas it has identified as strategically important and rich in resources. The Polar Research Institute of China (PRIC) estimates there are 500 billion tons of oil and 300-500 billion tons of natural gas on the continent, plus more in the Southern Ocean stating “when all the world’s resources have been depleted, Antarctica will be a global treasure house of resources.” China’s focus is on exploiting resources in and above the ground. China’s State Oceanic Administration (SOA) is the government department responsible for China’s Antarctic activities, the same department responsible for maritime law enforcement and the interface for the United Nations Convention for the Law of the SEA (UNCLOS). Moreover, the SOA oversees maritime surveillance in the SCS. China’s recent actions in this global common are of concern particularly when analyzing China’s future trends as a growing power in both Antarctica and the space domain. The lack of clear policy in the SCS or cooperation with international bodies such as ASEAN make it difficult to correlate diplomatic gestures when military modernization and expansion continue to occur. Headlined by large-scale investment, China is using Antarctica for the development of their ice-based satellite communications system; the placement of BeiDou 2 ground stations (China’s GPS equivalent) on the ice increasing the accuracy and capability of missile tracking, timing and positioning; and an astronomical program that includes infrared telescopes capable of detecting enemy satellites, drones, and missile launches. The use of this suite of technology means that in any future dispute, the targeting of Antarctic bases could be a reality even if the conflict is not on the continent. Several other threats stem from Chinese involvement in Antarctica that will affect international security such as commercial tourism; bioprospecting; and the undeclared (but inflammatory) military actions. Several of the Antarctic concerns can be directly transposed into the space environment where China expresses similar intent of establishing a lunar research base for scientific experiments. China’s Chang’e 4 lunar probe is hosting a 3 kg cylindrical container consisting of the first lunar biosphere experiment. China views exploration of outer space as part of its overall national development. 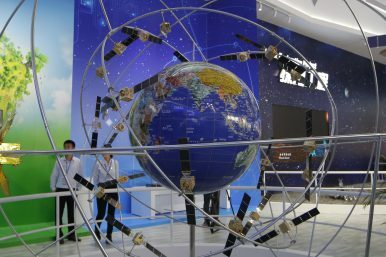 Its space-based BeiDou 2 system aims for global coverage by 2020. Furthermore, China aims to have a human-crewed space station by 2020-22 and a space-based solar power station by 2050, all to protect China’s national interests. Comparable to its actions in Antarctica, Chinese nationalistic goals and somewhat imperialistic advance will likely determine the shape of future conflict. There are signs that in Antarctica, a South China Sea type scenario could unfold where China is propelled by resource nationalism which is defined as “anti-competitive behavior designed to restrict the international supply of a natural resource.” Again, one can draw similarities in the future space environment by linking previous statements to subsequent actions. China continues to link space exploration with its economic goals, drawing further similarities with Antarctica. Leading Chinese space institutions have identified three unique space goals: space-based solar power (energy), lunar and asteroid mining (resources), and the establishment of its human-crewed space station (human presence). Comparing these goals with the Chinese rhetoric regarding Antarctica, we see similarities: the want to harness oil reserves (energy), the desire to test for and mine minerals (resources), and the buildup and expansion of basing (human presence). Moreover, when we compare Antarctica to the SCS, we draw further similarities with Chinese mapping of the entire geography, the renaming of landscapes and significant landforms in Chinese, and a gradual, calculated and intentional buildup of military equipment. The deliberate nature of Chinese actions both in the SCS and Antarctica should serve as an indicator to space powers that without regulations and ongoing dialogue the “first come, first served” mentality might prevail. Additionally, if the accumulation of military equipment in the SCS is replicated in areas of space, as it has been on the Antarctic continent, zones of non-interference could be set up denying access for commercial industry and governments alike. What would this strategic picture look like and what further tensions would this create on earth and in space? Notwithstanding the desire for China to grow in space, the U.S. has the ability to maneuver first given its superiority and industrial headstart. If the U.S. can maintain the advantage in space industrialization, it will likely have a significant say over the rules and laws that govern the exploration and maintenance of the global commons. Those that desire a peaceful future in space should stay tuned to the evolutions in the SCS and Antarctica for these will continue to indicate Chinese grand strategy and predict likely space strategy. L.M Foster is a Wing Commander (WGCDR) in the Royal New Zealand Air Force and currently a student at the United States Air University’s Air War College, Maxwell Air Force Base, Alabama, USA. He is currently studying towards a masters in strategy. WGCDR Foster has a C-130 Hercules Navigator background and has served in numerous operational theatres including the South Pacific, Afghanistan and Iraq. He has also operated in and out of Antarctica a number of times since 2003. DISCLAIMER: The views and opinions expressed or implied within this article are those of the authors and do not necessarily reflect those of the Royal New Zealand Air Force, the New Zealand Defence Force or the Government of New Zealand. All You Need to Know About China's New Stealth DestroyerChina Aims for the Moon – and BeyondChina and India: The Roots of HostilityHow China Is Weaponizing Outer SpaceWill China Adhere to Its Own Norm Prohibiting Lethal Drone Strikes?